Item #AM-QTZ-SL-300: Approx. 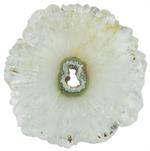 5" polished natural Quartz stalactite slice "flower" (Uruguay). 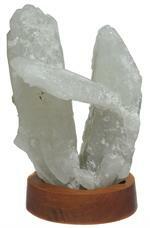 Item #AM-RHB-250: Approx. 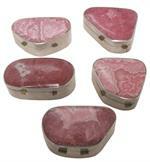 2.25"x1.5"x1" - 2.75"x2.5"-1" Rhodochrosite box. Sizes and shapes vary. Item #MS-1021: Approx. 9.5"x5"x4.25" Rhodochrosite on Quartz from Morococha, Peru. Item #MS-1034: Approx. 4"x2.55"x2.25" Rhodochrosite specimen (Santa Rita Mine near Casapalca, Peru) of 529.90 grams. Item #MS-1026: Approx. 12x9.5x5" Smoky Quartz specimen. 21.59 lbs. 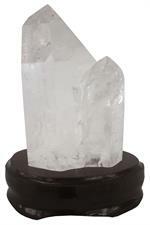 Item #AM-SQ-300: 5"x7" tall Smoky Quartz (Brazil) on 2 1/8" wooden stand. 3.71lbs. Item #MS-964: Approx. 3 1/2"x6"x2 3/4" Stilbite and Apophyllite specimen (Poona, India). 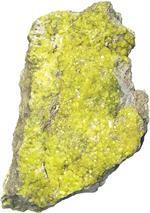 Item #MS-552: 8.5"x5"x2.25" tall, Sulphur (Napa, Potosi, Bolivia) of 2.93 lbs. Item #MS-257: From Kolwez Mining District, Zaire; 7.5"x4"x4" tall; 4.25 lbs. ; radioactive, Dark Green on Brown matrix.